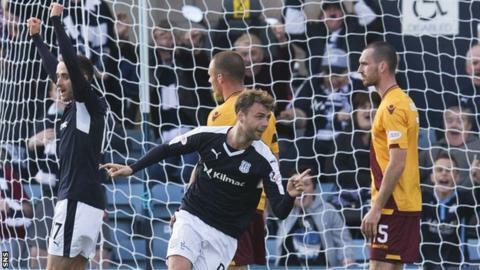 Dundee survived a late scare to record a narrow victory over Motherwell at Dens Park. The home side opened a 2-0 lead through Rory Loy and Kevin Holt, both goals coming after the break, and looked good for the three points. But Stephen Pearson pulled a goal back for Motherwell to set Dundee nerves jangling. Paul Hartley's men did not buckle, though, and move five points clear of their opponents. Interim Motherwell manager Stephen Craigan could not inspire his charges to a second successive victory and the club's attentions will now focus more sharply on finding a permanent replacement for Ian Baraclough. Loy's breakthrough goal brightened a hitherto drab afternoon of football in its creation and execution. Riccardo Calder carved out the opportunity from the Dundee left and, when his cross found its way to the edge of the six-yard box, Loy's acrobatic backheel beat Connor Ripley. There had been little to choose between the teams before that, but Dundee gave themselves further breathing space when Holt fired in a second. The full-back curled a low free-kick past the wall from 20 yards and beyond the outstretched glove of Ripley. Motherwell's lack of punch up front has been their Achilles heel all season, but Pearson gave them something to fight for when his cross from the left found its way past players from both sides and eventually into the net. Unfortunately for the visitors, they could not fashion another decent opportunity. By contrast, Dundee - after an uninspiring first hour - came to life after going in front. It followed a first period virtually devoid of action of any note, with Gary Harkins' injury-time free kick, which was turned round the post by Ripley, the only troublesome moment for either keeper. The opening stages were marred further by game-ending injuries to important figures on both sides. Greg Stewart was forced off following a clumsy challenge by Louis Moult and Dundee missed his creativity, compounded by the loss of Kevin Thomson in the middle of the park. Lionel Ainsworth, who had shown moments of promise, was also forced off after twisting awkwardly. Motherwell now face games against Aberdeen and Celtic and will hope to have a new man in charge to guide them through those tests. Match ends, Dundee 2, Motherwell 1. Second Half ends, Dundee 2, Motherwell 1. Rhys Healey (Dundee) wins a free kick in the defensive half. Jesse Curran (Dundee) wins a free kick in the attacking half. Goal! Dundee 2, Motherwell 1. Stephen Pearson (Motherwell) left footed shot from the left side of the box to the bottom right corner. Riccardo Calder (Dundee) wins a free kick in the attacking half. Attempt missed. Gary Harkins (Dundee) right footed shot from outside the box is close, but misses to the right. Attempt saved. Kane Hemmings (Dundee) right footed shot from a difficult angle and long range on the right is saved in the bottom right corner. Kevin Holt (Dundee) wins a free kick in the defensive half. Substitution, Dundee. Rhys Healey replaces Rory Loy. Nick Ross (Dundee) wins a free kick on the right wing. Nick Ross (Dundee) wins a free kick on the left wing. Substitution, Motherwell. Theo Robinson replaces Keith Lasley. Goal! Dundee 2, Motherwell 0. Kevin Holt (Dundee) from a free kick with a left footed shot to the bottom right corner. Attempt saved. Rory Loy (Dundee) left footed shot from the right side of the box is saved in the bottom right corner. Attempt saved. Scott McDonald (Motherwell) left footed shot from the centre of the box is saved in the centre of the goal. Goal! Dundee 1, Motherwell 0. Rory Loy (Dundee) left footed shot from the centre of the box to the bottom left corner. Assisted by Riccardo Calder. Corner, Dundee. Conceded by Stephen Pearson. Kieran Kennedy (Motherwell) is shown the yellow card for a bad foul. Foul by Kieran Kennedy (Motherwell).